Hmm? Is there something wrong with being excited for Meridell’s birthday? Or maybe I just like kazoos. So, anyway, this article is dedicated to the... erm, wonders, of Meridell! On the day of its release, Meridell brought two new shops to the face of Neopia. One of the shops was Merifoods. Honestly, you can’t get anything delicious to eat in that shop. On the contrary, the tastiest thing that can be found in that shop is probably some Stale Bread, unless your Neopet enjoys eating gruel. 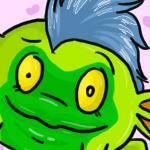 You can also visit Ye Olde Petpets if you’re looking for a friend for your dear Neopet. You can also visit the Round Table Poker and play a few games. And, if you are up to the task, you can bet 50 NP to kiss a nice, slimy Mortog in hopes that it turns into a prince or princess. You don’t want to see what happens if you kiss the wrong Mortog, though. It’s... disgusting. There’s one more gambling game that you can play in Meridell. Double or Nothing is a fun game that can be played inside the Meridell castle with the treasurer, Snargan. With a bet of 10 NP, Snargan will flip a coin. If it’s heads, your bet is doubled and you can keep playing for as long as you want (or can). If it’s tails, then Snargan keeps your bet. If you aren’t into gambling, there are still a lot of games that you can play. In fact, there are too many to list in this article, so I will just tell you about a few. For instance, if you like bullseye, then Ultimate Bullseye is for you! Take ten shots and try to get as many points as you can! Get bullseyes for cool power ups! Who said potato counting couldn’t be extreme? Well, in Meridell, you can also play an interesting game called Extreme Potato Counter. You have to count how many totally radical potatoes go flying across the screen. Tuber-ler! If you are out in Meri Acres Farms, you should play the game Attack of the Slorgs! In this game, you can use the Slorgeriser X4 to blast the Slorgs that are devastating the Meridell crops! It’s pretty fun, but remember that you need the Shockwave Plug-in to play it! And, last but not least, I will tell you about the game called Escape from Meridell Castle! *blows kazoo again* In this game, you control a Draik that has been imprisoned in the castle for a crime that he didn’t commit! You must guide him through the tricky maze of labyrinths and dungeons to save him! You can also create your own level with the level editor mode of the game! One of the many reasons that Neopians from all around the world visit Meridell is in hopes of getting a quest. Indeed, an Earth Faerie by the name of Illusen has retired to the quiet life of Meridell. If you’re up to the challenge, why not have a go at one of her quests? You may be rewarded for your effort! Jesters from all over Neopia also visit Meridell Castle in hopes of impressing King Skarl. Twice per day, you can tell the King a joke, and, if he likes your joke, you will be rewarded with a wonderful prize. But it he doesn’t... oh, who knows what will happen? One last person that you should put on your agenda is the Kacheek at the Rubbish Dump! There, you might find some rather exciting things that you can take home for free. And remember, you get what you pay for... or in this case, what you don’t pay for. While we’re on the subject of Petpets, I will remind you to visit the mysterious Symol Hole. If you are feeling brave enough, then you can let your Petpet dive into this strange hole. It may return with a present for you! The last thing on your agenda for the day is a nice relaxing game of Cheese Roller! Yes, you heard me right, this is a game where you purchase cheese... and roll it down a hill! If you can get it to the bottom in less than sixty seconds, you will get to keep your cheese. Even if you don’t, you might still get a Neopoint reward. So, that wraps up my article about the wonders of Meridell. Hopefully, you will be intrigued enough to spend a day in these peaceful lands. Who knows what can happen?